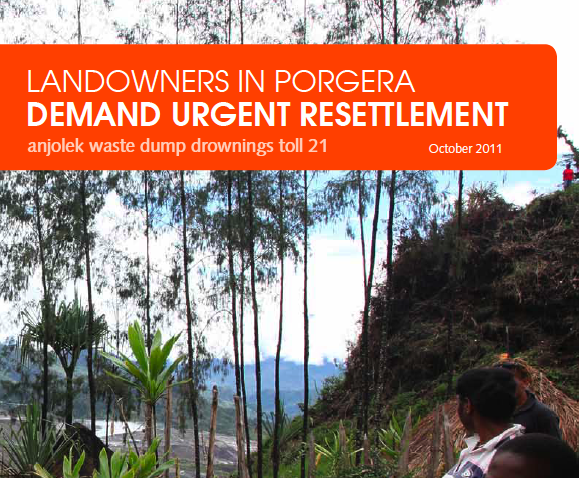 The Porgera Land Owners Association (PLOA), in partnership with the Porgera Alliance released a report today detailing the case for the urgent resettlement of their people away from Barrick’s Porgera mine. The report covers the health hazards associated with living close to the mine, as well as enumerating the human rights abuses caused by mine security. The report also recounts the history of the mine’s agreements with the local community, revealing a pattern of neglect of the community’s free, prior and informed consent at nearly every stage of the mine’s development. This report follows investigations and reports published by Amnesty International, Harvard Law, Human Rights Watch, and the Norwegian Government all detailing the dangerous conditions near the Porgera mine. However, this report stands out as a comprehensive look at the history of the Porgera mine, from the perspective of the landowners who have led negotiations with the company.